Rachel Sang is our Store Manager and director of our children's department. 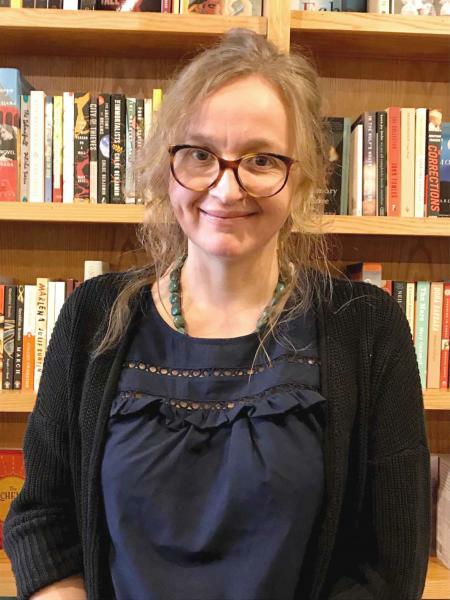 That means that in addition to keeping everything running smoothly for the booksellers, she's the one choosing books for each of our Picture Book, Chapter Book, Middle Grade, and Young Adult Brilliant Books Monthly subscribers. If you can't find her on the bookstore floor chatting about her latest staff favorite or an awesome upcoming kids' book, she's probably in the window, working on our next fantastic display! I am a nature loving, art making, fly fishing mother of two children and two furry canines. When I'm not a work, it's likely I'm outside somewhere maybe working on a garden, walking dogs in the woods, or bike riding with my family. I'm happiest when I'm making things, whether it be art or a really good meal. If I've met you, I've probably told you I used to live in Montana. Everyone should live somewhere else for a while. I miss the mountains, but family brought us back to Michigan and the big lakes. What's the quirkiest job you've ever had? Not necessarily quirky, but awesome -- In Montana, we lived outside Yellowstone National Park where I worked at a fly shop and had the opportunity to guide fly fishing trips. In the winter, I worked for a snowmobile tour company that guided over snow tours of Yellowstone. Bison, geysers, wolves and so much snow! What are the top five most interesting things about you? I make art and have had the chance to make posters for some great bands. Art and music were once a huge part of my life. I lived in Kalamazoo for many years and was part of an arts/music/coffee shop collective called the Space. Here at Brilliant Books, I get to use some of those skills making window displays, so much fun! I cook really good food but rarely use recipes. I've dabbled in homesteading, but we gave it up to live in town, because spending so much time in the car commuting was for the birds. On birds, I can identify many of them. Tell us about meeting a favorite author, or avoiding one! I once ate continental breakfast in the same room as Jim Harrison. I didn't say anything -- who wants to talk to some stranger while eating rubbery scrambled eggs? If you weren't a bookseller, what would you be doing instead? In an ideal world, I'd be at home, making art in my art studio to support my family as a successful artist. I'd also like being a park ranger. If you could invite five people, real or fictional, living or dead, for dinner, whom would you invite? That's today's list, I'm sure it would be different tomorrow. Rachel is also one of our Brilliant Books Monthly book selectors. Learn more about how she chooses books for young readers!